One of the staples of the neocon-Russophobe narrative is that Russia is alone in the world, utterly bereft of friends, left only with the likes of Nicaragua and Nauru to indulge it in its anachronistic “imperial fantasies”. Not really. Conflating the West with the world won’t change the fact that amongst the peoples of China, India, and most of the Middle East and Latin America – that is, the regions containing the bulk of the world’s population and future economic potential – Russia is actually viewed rather favorably. But what about peoples recently liberated from the oppressive, iron boots of Russian chauvinism – surely they dislike Russia? Not that simple. Some sure do – Estonians, Poles, West Ukrainians, Georgians… But plenty more don’t (Armenians, Bulgarians, East Ukrainians). It’s a complex picture of significant political and geopolitical import. Back in November 2008, the VTsIOM polling site released some very detailed results about what peoples in the former Soviet Union think about each other. The first graph below asks people which countries they consider to be friends or allies of their country. And these were the results. Some 74% of Belarussians, 58% of Ukrainians, 49% of Moldovans, 82% of Armenians, and 67-89% of Central Asians named Russia as a friend and ally. In contrast, only 11-17% in Georgia, Azerbaijan and Lithuania like Russia this way, but that is hardly surprising. (The Latvians are rather higher at 26%, presumably because of their large Russian minority, though far higher numbers, almost half of them, orient themselves with the other Baltic states). The poll below is even more telling. It asks peoples in the former USSR to name which countries or blocs they would like to unite with, the main contenders being Russia, the EU, and “independence”. Russians are mostly split between those favoring some kind of Slavic or Eurasian bloc (37% – Belarus, 29% – Ukraine, 24% – Kazakhstan), and Russia-as-is (32%); the European Union really isn’t that popular at 15%. This isn’t much different in Ukraine or Belarus. Some 56% of Belarussians and 47 of Ukrainians would like to unite with Russia, while 25% and 22% favor the EU, and 18% and 25% favor independence, respectively. Some 51% of Kazakhs favor Russia and 32% independence. The Moldovans are equally split between Russia and the EU or independence (which in practical terms would mean the Romanian sphere of influence). The Azeris identify most strongly with Turkey, with 31% expressing a desire to join it, followed by 24% yearning for the EU and 24% for continued independence. Big majorities (65-73%) in the Central Asian nations of Tajikistan, Kyrgyzstan, and Uzbekistan would like to rejoin Russia, which is unsurprising given their relative underdevelopment and the relative success of Russification there. Georgia has always had a strong sense of national identity, including during the Soviet period, so by far the majority there wants independence (38%) or the EU (37%); only 10% wouldn’t mind falling back into Russia’s sphere of influence. Why is this important? Because to some extent, even in semi-authoritarian systems, national leaders are to some extent beholden to popular sentiment. This is not to say, of course, that this is the only factor – an objective assessment of national interests (which are often synonymous with the interests of the ruling elites) almost always trumps anything else. 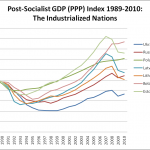 But it does illustrate that the much ballyhooed “Russian resurgence” across the former USSR rests on firmer foundations than just political pressure or economic takeovers – of at least equal importance is that many of the peoples in its path back to regional hegemony aren’t actually that averse to it*. PS. Another useful survey of attitudes towards Eurasian regional integration by Gallup: “In all countries except Azerbaijan, the median average wants at least an economic union across Eurasia”. * The big exception is Georgia. This is where there is both a clash of primary geopolitical interests (the irreconcilability of Georgia westward path and Russia’s desire to anchor itself in the South Caucasus) and of civilizational values (AFAIK, the only social grouping in Georgia with a real pro-Russia tendency are the monarchist “People’s Orthodox Movement“). Coupled with simmering border tensions, it is probably not surprising that this developed into a flashpoint for armed conflict.